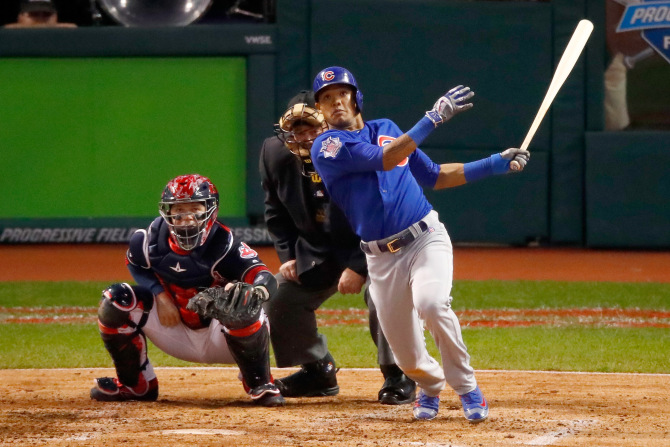 Former Burlington Bees shortstop Addison Russell tied a World Series record Tuesday by driving in six runs for the Chicago Cubs in Game 6. Russell drove in two runs in the 1st inning, on a pop fly that dropped between outfielders Tyler Naquin and Lonnie Chisenhall, and four more on a grand slam in the 3rd inning. Only three other players have driven in six runs in a single World Series game: Bobby Richardson (1960, Game 3), Hideki Matsui (2009, Game 6), and Albert Pujols (2011, Game 3). Russell is the first shortstop to hit a grand slam in a World Series game, and the 22-year-old is the second-youngest player to do so. (Mickey Mantle was 21 when he hit a grand slam in Game 5 of the 1953 World Series.) The home run was estimated to travel 435 feet, making it the second-longest one of his major-league career. As an Oakland Athletics prospect, Russell batted .310 with 9 RBI and 5 SB in 16 games with the 2012 Burlington Bees. The A’s traded him to the Cubs in a five-player deal in July 2014. He made his MLB debut in April 2015. This entry was posted in Burlington Bees, Midwest League. Bookmark the permalink.